Order before 12 Noon for Free Same Day Local Delivery. Order by 5pm for Free Next Day Local Delivery. Subject to goods being in stock. We can offer alternative. Phone for availability on 01455 557177. At Max Electrical we use our own expert delivery and installation team who deliver throughout Leicestershire, Warwickshire and Northamptonshire. If you live outside of this area and would like a item delivered please phone our friendly team on 01455 557177. Free delivery is available on anything you buy from us and quite often if we have it in stock we can offer FREE Same or Next Day Delivery. Our prices are competitive and our service is always 5 star, delivery slots are scheduled for morning (09:00 - 13:00) or afternoon (13:00 - 17:00). Upon request we can try and be more specific. We offer professional expert installation on all the products we sell. Our fully house trained installers can disconnect and take away your old appliance as well as install your new appliance for you. To keep our prices competitive we do charge for installation and recycling services which can be found on the product pages. Our installation team are the best in the business and can answer any questions you may have as well as give you a demonstration. We also do bespoke installation such as TV wall mounting, aerials, surround sound. Phone 01455 557177 for a free quote. Here at Max Electrical we always aim for 5 Star Service and nothing less! See what our customers say about us and you will see why customers love shopping at Max Electrical. You can recycle your old electricals with us. Why recycle? Unwanted electrical equipment is the UKs fastest growing type of waste. Many electrical items can be repaired or recycled, saving natural resources and the environment. If you do not recycle, electrical equipment will end up in landfill where hazardous substances will leak out and cause soil and water contamination - harming wildlife and also human health. We can help - We are pleased to offer our customers the chance to recycle their old electrical items. Max Electrical are doing their bit under these regulations to offer their customers the option to recycle their old appliance, we can collect old electrical goods for a fee. Or you can return/drop off items at Max Electrical, 2 Church St. Lutterworth, Leics, LE17 4AW. Max Electrical are doing their bit under these regulations to offer their customers the option to recycle their old appliance like-for-like when they purchase a new electrical appliance by taking away their old appliance when we deliver their new one. To remind you that old electrical equipment can be recycled, it is now marked with a crossed-out wheeled bin symbol. Please do not throw any electrical equipment (including those marked with the crossed out wheeled bin symbol) in your bin. 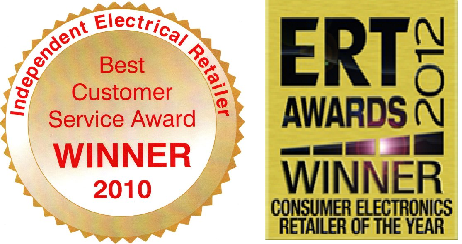 Lutterworth Sound & Vision earnt the title of Consumer Electronics Retailer of the Year in 2012 as a part of the annual ERT Awards competition. Consumer Electronics Retailer of the Year is carefully selected by expert judges. Also, in 2010 we were awarded by the Independent Business Awards with the Best Customer Service Award Winners! "You will have and an easy and enjoyable experience shopping at Max Electrical - you have my personal guarantee on that." Ian Jones.